For hundreds of years, a perky little feline has been linked in Asian cultures to good fortune. The pretty, painted Maneki Neko lucky cat is considered a powerful feng shui remedy and accorded a place of honor in homes and businesses. During the Edo period in Japan (1615 -1868) Maneki Neko made its first recorded appearance. 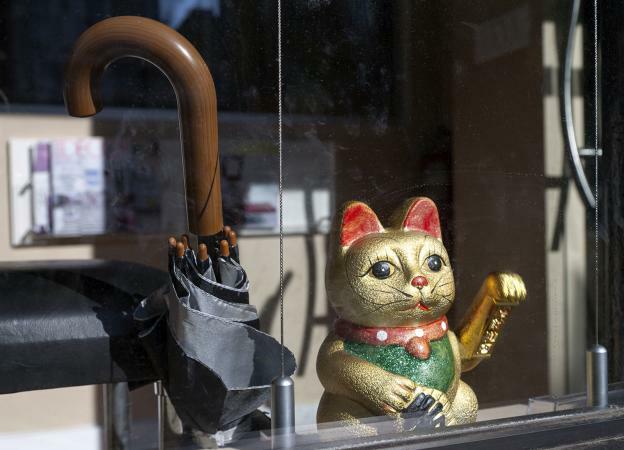 "Maneki" means "beckoning" and "Neko" means "cat" in Japanese, and the cats have always been associated with welcoming or inviting protection, wealth, and good fortune. 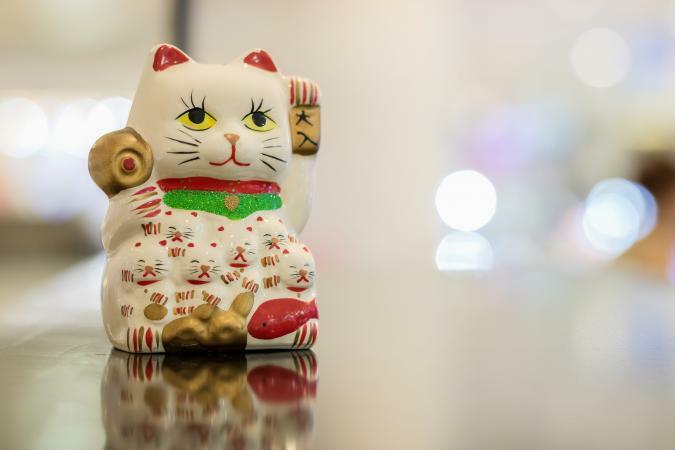 Today, you will find the ceramic cats near the cash register in Asian shops and restaurants, at the entryway to businesses and homes, and in wealth corners, as an added incentive to prosperity. Look carefully at its paw - the figure features at least one paw raised in a welcoming or waving gesture. An upraised right paw invites luck and money. If the left paw is raised, customers will flock to a business. When you find a lucky cat with both paws up, it means doubled good fortune or strong protection. Almost always, this tiny, charming feline is smiling - an optimistic image with an optimistic mission. Lucky cats are fancy felines with symbolic accessories. They often sport an "embroidered" bib, a shiny gold bell, and a collar - all affectations of pampered Edo-era cats belonging to wealthy owners. The bell simply made it easy to find the cat. But Maneki Neko also grasp or carry a few tchotchkes and each of these has significance. A small, decorated hammer is a money mallet - to summon wealth, naturally. A fish signals prosperity - these might be silver or scaly golden "lucky" carp. A crystal, marble, or gemstone "ball" is an obvious marker for wealth. The clear or crystal ones can indicate or invite wisdom. A prayer poem or prayer tablet welcomes fortune the same way traditional "door poems" (displayed during the Lunar New Year) do. A daikon radish symbolizes abundance. A koban, or gold-colored coin copied from the Edo period, suspended from the cat's collar, stands in for extraordinary wealth or your future if you keep that cat well-dusted. 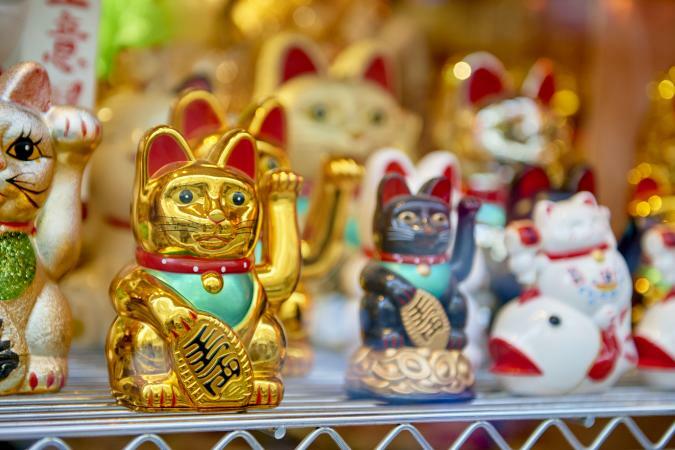 There are numerous stories about the origins of the lucky cat tradition and you can choose your favorite. One tale recounts a traveler to a modest shrine who took shelter under a tree during a storm. When a little cat seemed to be waving him into the temple, he moved, just as the tree was struck by lightning. In gratitude, the traveler supported the temple generously after that. Another story involves a poor old woman who could not afford to feed her cat. Heartbroken, she explained to the cat that she would have to abandon it, but the cat told her to make a clay cat figure first. The old woman made such a fine image of her cat that she sold it for good money -- and continued to make clay figurines that kept her and her beloved pet in abundant food for the rest of their days. One more adventure comes from geisha and feudal culture. It is said that a favorite geisha adored her cat but, one day, it would not stop pulling on her robes during a formal ceremony. Enraged, the feudal lord had the cat beheaded and the head flew up and sank its teeth into a poisonous snake that was poised over the assembled guests. To dry the tears of the geisha, a statue of the cat was created and given a place of honor in the household. 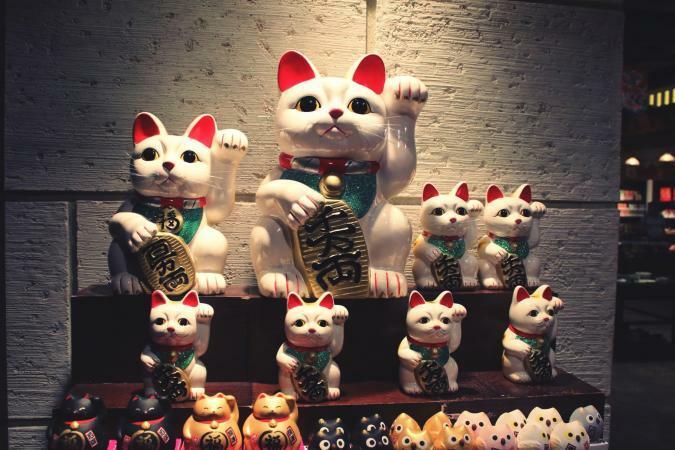 Traditional Maneki Neko cats are calico and these are considered the luckiest. Even within feng shui placement, this style of lucky cat belongs anywhere. But different colors of cats have different meanings and these might influence where you keep your bit of luck. This gilded feline belongs in your wealth corner, the southeast corner of your room, home, office or desk. Count on a salary increase, unexpected income, or new opportunities to create financial abundance. In feng shui, a cloud-colored kitty goes in the north section of a space for greater prosperity, the west to summon creativity or children, or the northwest for travel and helpful people. This cat is the color of love, so that's what you get when you park it in the southwest area of your room or home. In the south corner of any space, the red cat will bring greater fame and successful ventures. Far from unlucky, this black cat will bring you more money when you place it in the north or southwest area of any space. It will enhance your investments from a perch in the southeast. And black or blue cats will protect you from illness and bring you good health if you find room for them in the east area of a room or building. The color of life, a green lucky cat in the south amplifies positive energy and fame, especially from educational achievement or creative pursuits such as writing or art. Shift it to the southeast to increase wealth. 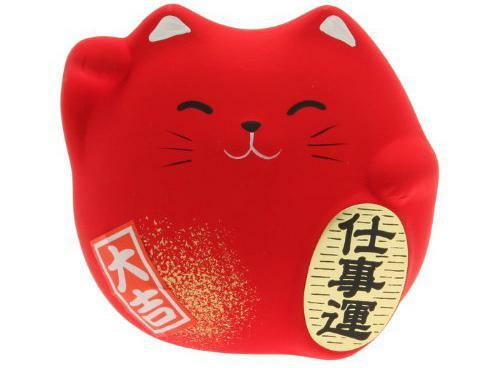 You can purchase a Maneki Neko in any Chinatown or Asian commercial area in any big city, find them everywhere for sale on the Internet at websites like Amazon and DHgate.com or, most auspicious of all, receive one as a gift. Bok Lei Po Trading on Mott Street in New York City has a small, round lucky cat in a variety of colors for about $10. Prices online and in stores range all over the map, depending on the quality and size of your statue, piggy bank, or even key chain. But the Maneki Neko's luck doesn't require a major investment to work for you. Try adding a Maneki Neko to the decor in your business or home. A lucky cat in your dorm room is cute and might just help you get through finals. A kitty in the kitchen could boost the healthy nutrition you cook into your meals. That cat by the cash register may make you more mindful about counting out change. A friendly, fun little lucky cat anywhere is an invitation to smile and contemplate good fortune, an upbeat attitude that could draw positive energy to you and your daily pursuits.